Athlon looks at the top fantasy football rookies for the 2013 season following the NFL Draft. Doug Martin (1,454) and Trent Richardson (950) were No. 2 and 3 among all rookie NFL running backs last year in rushing yards. They were both first-round picks and played as such in their first season. As the final seconds ticked away at Florida State’s Doak Campbell Stadium last fall, defensive tackle Sharrif Floyd was in no mood to celebrate his Florida Gators’ upset of their bitter rival. Not yet, at least. Floyd was too tired. 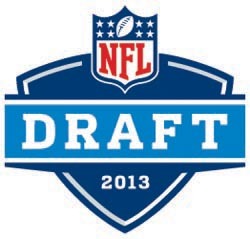 The 2013 NFL Draft will commence tonight (8 pm ET) with the first round in primetime on ESPN. While 222 players will be taken on Friday and Saturday, it's the 32 whose names will be called in the first round that have everyone's attention. Size, speed, stats and awards don’t matter if a prospect is Physically Unable to Perform. Here are biggest health concerns in the 2013 NFL Draft. Some of the game's best players aren't from the U.S. The NFL is interested in expanding its presence internationally, and the world is reciprocating by providing talent for league teams. Kansas City Pro Bowler Tamba Hali (Liberia), standout Raiders kicker Sebastian Janikowski (Poland) and Giants end Osi Umenyiora (England/Nigeria) are just a few of the many imports found on NFL rosters last year. Expect that number to swell in 2013, thanks in part to these four top prospects.